What Is Good ROI for Marketing Campaigns? What Is Good ROI for Your Marketing Campaigns? Return on investment (ROI) is one of the most important metrics for determining the success of a campaign or program. By tracking the level of return from investments in marketing, business leaders understand the effectiveness of the company’s marketing program. But what is good ROI for marketing campaigns? At its most basic level, “good ROI” means that for every dollar put toward marketing, the business gets more than a dollar back. But if your business gets less than a dollar back for every dollar invested in marketing? Then marketing team, prepare to come under scrutiny. To maintain the trust of peers, marketers must confidently hold the reigns when it comes to tracking their return on investment. You do not want to be surprised by dwindling ROI data, and then put on the spot to explain it. Marketers must understand which investments drive the greatest profit margins, and how their performance is trending over time. To help you take ownership of your ROI reporting, let’s discuss the basics of how to calculate marketing ROI, key benchmarks for measuring performance, and the specific metrics used to measure return on marketing investment for different business models. What is good ROI for marketing? ROI is a measurement of the value that an investment provides. In broad economic terms, it is the return you gain relative to the price of the initial investment. ROI generally denotes the profitability of an investment, but it can be used to measure different things depending on what a marketer considers to be the costs and the returns. Ideally, the gain from your investment is revenue or sales transactions. However, if you don’t work in a high-transaction business, it can take weeks, months, or even years to track closed business from each of your campaigns. For this reason, it is prudent for marketing teams to use leading metrics — or metrics that serve as a proxy for revenue — to track the ROI of their campaigns in real time. The challenge, then, is to pick leading metrics that are relevant and important to your business. Typically, these leading metrics serve as markers of progress towards a sale, or key performance indicators (KPIs). However, leading metrics vary widely depending on your business model. Let’s break down the most common leading and ROI metrics according to three main business models: ecommerce, lead generation, and content. Leading metrics include: Website traffic, newsletter subscribers, social media engagement, and items added to cart. ROI metrics include: Ecommerce transaction volume, average sales price, and sales revenue. Leading metrics include: Website traffic, key form conversions, webinar and event attendance, and demo completion. ROI metrics include: Lead volume, lead quality, lead conversion rate, and closed business. Leading metrics include: Website traffic, average session duration, average pages per session, and community engagements (comments, shares, survey completions, etc.). Regardless of your business’s overall objectives, each marketing program and campaign will experience fluctuations in leading metrics and ROI results over time. So what is good ROI for marketing across channels? To understand what good ROI looks like for specific channels, you can turn to two primary sources: industry benchmarks and your own historical performance. Use the benchmarks below to compare your performance against the marketing landscape. Research conducted by Larry Kim provides conversion rate benchmarks for business businesses who advertise on Google AdWords. Note, these conversion rate benchmarks reflect the overall conversion rate for an advertiser, not the performance for a single ad or landing page. Take note of the exponential increase in conversion rate for top-performing advertisers: the top 25th percentile sees a 2X conversion rate compared to the average advertiser, while the top 10th percentile sees a 5X conversion rate. Among known marketing channels, the average ecommerce order value is highest from direct traffic, followed by search traffic and email marketing. The average order value is lowest from social media. The average add-to-cart conversion rate is 8.59 percent in the United States and 8.82 percent globally. Want to benchmark your email marketing performance against the average conversion rates in your industry? MailChimp publishes — and regularly updates — a comprehensive set of email marketing benchmarks by industry and company size, including open rates, click-through rates, unsubscribe rates, and more. Benchmarks like the above are wonderful guide posts. They show you what’s possible, and can shine a light on areas for improvement. However, the best way to determine good ROI for your business it to look at your historical performance. Track your leading and ROI metrics over time to identify fluctuations in your marketing performance as they happen. Are you able to drive more sales with less budget? You might if you can identify the channels that are underperforming for your business. 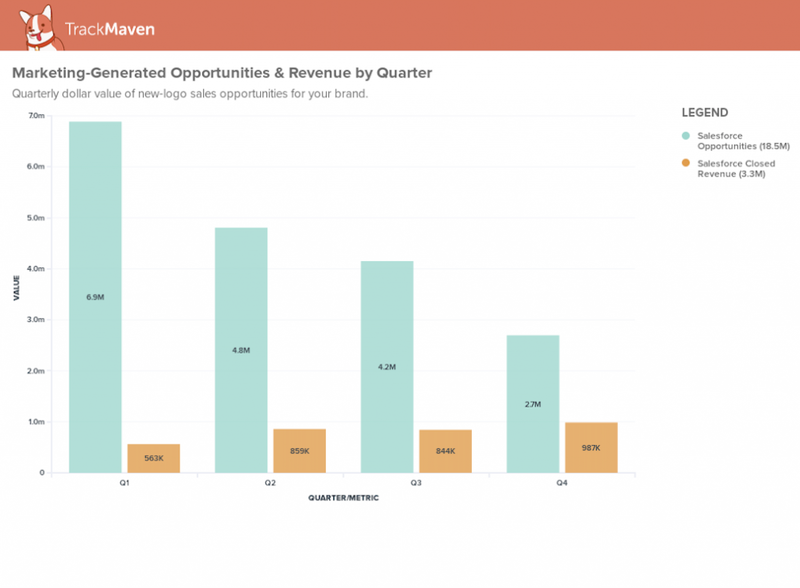 Here’s one example of a real-time ROI dashboard from the TrackMaven platform. In this report, you can see that this B2B business is producing fewer sales opportunities over time. However, the revenue from closed business is increasing quarter-over-quarter. This could indicate that this organization has become more efficient with its lead generation by attracting leads with a higher average sales price. For most businesses, the ROI from content marketing is higher than the average marketing channel. After all, no matter how good your Google AdWords or PPC campaigns are, their ROI will stop cold the second you stop paying for it. Good content, however, will continue to drive traffic and conversions (especially if you make a point to continually update and optimize your content). Measure click-through rates from ads to product pages and shopping cart pages. Use Google Analytics destination goals to measure the total number of page visitors that complete an ecommerce transaction and the average conversion rate. If your business uses a CRM to measure ecommerce transactions, you should also have the ability to track the number of transactions, average sales price, and sales revenue by channel and campaign. It’s important to note that all of these metrics are results metrics. But remember, ROI is calculated by subtracting the cost of the investment from the gain from the investment divided by the cost of the investment. That means you can’t just look at the ecommerce revenue from each of your digital channels, look for the highest number, and then declare that channel the winner. Instead, you need to keep a running tally of your expenditures by channel and campaign. For example, you may have driven $1,000 in sales from Instagram ads. But if you spent $2,000 on those Instagram ads, your ROI is actually in the red. Do you have a way to track your marketing expenses? If not, don’t panic! We have a fully built-out marketing budget template you can use to plan and track all of your marketing spend for the whole year. If lead generation is your top priority, then the most common ROI metrics are lead volume, lead quality, lead conversion rate, and closed business. On a more advance level, however, marketers tasked with lead generation can link leading metrics with ROI metrics to provide a pulse for both brand awareness and lead generation simultaneously. One of my favorite correlative KPIs is the website traffic to organic sales accepted leads (SALs) ratio. Here’s how to calculate it. For example, if you generated 2,000 new SALs from you website last month, and had 50,000 unique website visitors, your organic SAL to traffic ratio is four percent (2,000 / 50,000 = 0.04). The right ROI metrics for your business can also depend on your organization’s maturity. Just getting started? Then web traffic and lead volume are more important to get your business off the ground. As your business becomes more established, however, lead quality becomes increasingly important. You don’t just need leads, you need the right leads with intent to buy. And finally, once you’re business is fully mature, it’s time to turn your attention to retention. Keep a closer eye on customer retention, churn, customer lifetime value, repeat customers, and customer referrals. community engagements such as comments, shares, letters to the editor, survey completions, and more. You can use website analytics, such as Google Analytics goals, to track subscribers over time. Using UTM parameters, you can understand which channels drive the highest number of subscriptions, the greatest time on site, and more. No matter your business model, there is one major watch-out when it comes to obsessing over ROI: it can quickly turn into navel gazing. Make sure to keep your ROI in a larger industry context. Good marketing ROI can vary greatly depending on market demand for your product or service. For example, if you’re in a growing marketing with increasing demand, then steady ROI is not good ROI. Your aim should be to capture greater market share as demand increases. Conversely, if you’re in a shrinking market, you might want to strap in for rocky ROI. Increased investments could help you to grab dwindling market share from competitors, but beware of overspending. With demand going down the drain, you’ll be fighting for a bigger slice of a smaller pie.